HomeAnalysisQuestion: How Many Americans Are Taking Psychiatric Drugs? Question: How Many Americans Are Taking Psychiatric Drugs? QUESTION: How many people do you know that are on psychiatric or psychotropic drugs of one form or another for maladies that run the gamut from depression to hyperactivity? It is estimated that well over seventy million Americans are on mind altering drugs (over 20% of the entire country’s population and some estimate it approaches 100 million) and the proof that these drugs are doing more damage to these individuals than any possible positive benefits, mounts daily. With Big Pharmaceutical paying out damages and fines that total well into the billions for prescribed drugs ranging form antidepressants to tranquilizers, anti-psychotic drugs, mood stabilizers, stimulants and more, why does this scourge on America continue … PROFIT plain and simple! When the damages paid out are insignificant (the built in cost of doing business) compared to the profit derived by Big Pharmaceutical, with the complicity of a bought and paid for government healthcare infrastructure who’s motto is (CDC) “Protecting lives and your health 24/7” … well you get the drift. Deaths from legal and prescribed drugs in this country far outnumber deaths from illegal drugs, so where is the war on so called legal drugs? Our military and veterans are massively over prescribed these psychotropics to a point that their suicide rate is a serious shame on the conscience of America and yes the causality is a fact. 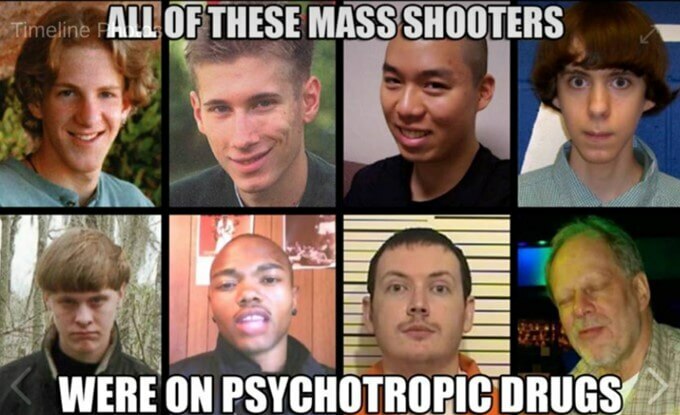 Why is it the a vast majority of mass shootings in the twenty first century were perpetrated by individuals who were either on, or had just stopped taking Psychotropic/Psychiatric drugs … ??? Our much more vulnerable children are drugged at the drop of a hat and, in a rising number of cases, against the will and wishes of their parents, turning them into nonproductive Zombies manufactured by the state. These numbers show there is a plague afoot in America—a plague of diagnosing and prescribing drugs. Over the past 35 years, I’ve spent a great of time reporting on the complete falsity of psychiatric diagnoses, as well as the extreme toxicity of the drugs. We’re talking about nothing short of chemical warfare against the population. The nation is being eaten out from the inside—and all under the guise of proper psychiatric treatment. I’ve spoken off the record with psychiatrists who readily admit that the whole basis on which mental disorders are labeled and described and diagnosed is a rank fraud; and they’ve also told me that this is an open secret inside the psychiatric profession. I’ve published quotes from well-known psychiatrists admitting there are NO diagnostic lab tests for ANY of the 300 officially certified and labeled mental disorders. “What? !” you say, bolting out of your chair. Psychiatry has monopolistic protections from the federal government. Without them, in a truly free and competitive market, the profession wouldn’t last another 20 years. But that’s socialism for you. The government, colluding with corporations and professional organizations, gives credence and primacy to a whole industry that is based on fabrication and does grave harm through its products (the drugs, in this case). Who could resist such a good deal? About the Author: Jon Rappoport is the author of three explosive collections, THE MATRIX REVEALED, EXIT FROM THE MATRIX, and POWER OUTSIDE THE MATRIX, Jon was a candidate for a US Congressional seat in the 29th District of California. He maintains a consulting practice for private clients, the purpose of which is the expansion of personal creative power. Nominated for a Pulitzer Prize, he has worked as an investigative reporter for 30 years, writing articles on politics, medicine, and health for CBS Healthwatch, LA Weekly, Spin Magazine, Stern, and other newspapers and magazines in the US and Europe. Jon has delivered lectures and seminars on global politics, health, logic, and creative power to audiences around the world. You can sign up for his free NoMoreFakeNews emails here or his free OutsideTheRealityMachine emails here. This (attached) article (How many people are on psychiatric drugs?) was originally created and published by Jon Rappoport’s Blog and is republished here with permission and attribution to author Jon Rappoport and Jon Rappoport’s Blog.